Tofu Scramble is THE perfect vegan alternative to Scrambled Eggs. 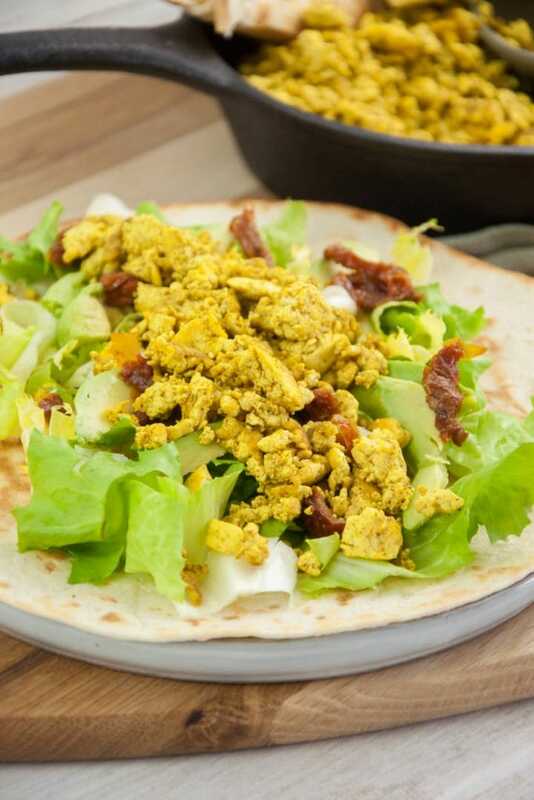 It’s delicious for breakfasts, brunches as well as a lovely mix-in for a stir-fry or a taco or burrito filling like in the breakfast burrito with chickpea crepes. I highly recommend getting Kala Namak, which is the Himalayan Black Salt. Due to its high sulfur content, it’s perfect for all dishes that profit from an “eggy” taste and smell. And what would be a more perfect use for the salt than Tofu Scramble? I still remember the first time I made Tofu Scramble with Kala Namak years ago, I was so blown away by how delicious and egg-like it was, I’ve been making it ever since! Step 1: In a large pan with canola oil, scramble the tofu with your fingers or a fork. Step 2: Add the turmeric powder, curry powder, and kala namak. Step 3: Stir until the tofu is evenly coated. Let it cook for 5-10 until hot! And done! in a wrap or burrito! 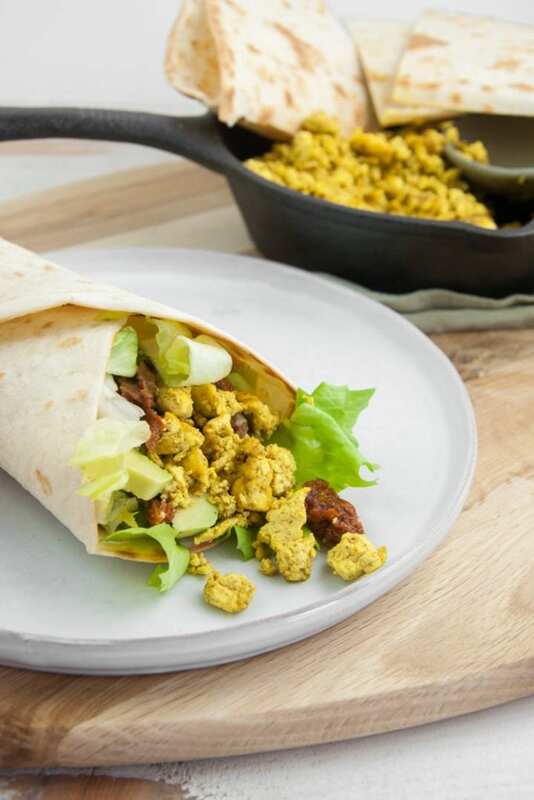 I love to use the tofu scramble as a filling for wraps and burritos! One of my favorite combos is lettuce, avocado, tofu scramble, and sun-dried tomatoes canned in oil. Can you reheat Tofu Scramble? Yupp! Just put it back in the pan and heat until warm. If you want to add moisture, you can add a splash of non-dairy (and unsweetened!) milk. What to do with leftover Tofu Scramble? As mentioned above, you can reheat tofu scramble OR you can use it in a vegan “egg” and veggie stir-fry (fried rice), on breakfast pizza and it’s amazing as a wrap filling! I don’t have Kala Namak. Do I really need it? I’m a HUGE fan of Kala Namak. 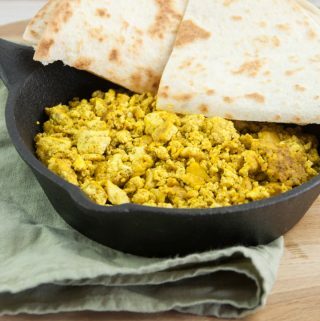 You can totally make Tofu Scramble without Kala Namak, but it really doesn’t taste the same! You will be missing out on the typical eggy taste and smell. 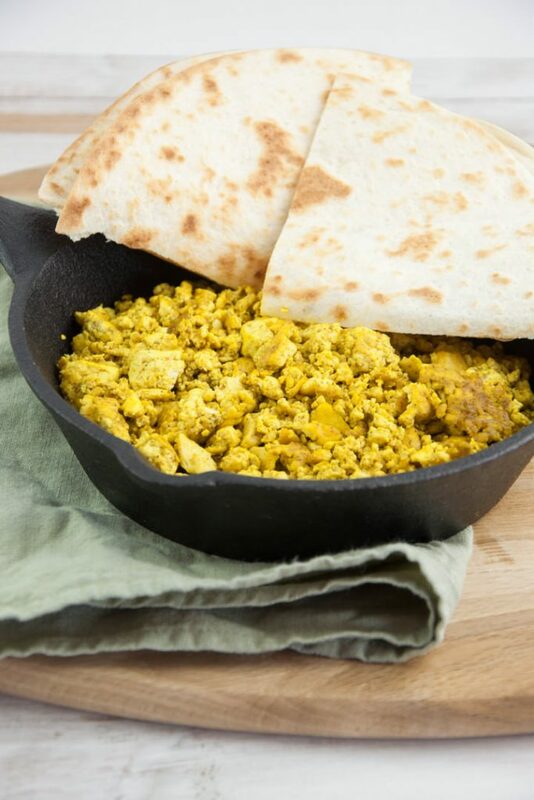 Kala Namak is not only amazing for tofu scramble, but also for vegan omelets made with chickpea flour. In my opinion, it’s worth buying it! I want to make soft scrambled ‘eggs’. Any advice? I prefer having crispy bits in the Tofu Scramble, but my friend is a sucker for soft ‘tofu scramble’. You can achieve this by adding unsweetened plant-based milk or cream such as oat cream while cooking it. Or you can whisk together oil, flour, and nutritional yeast over low heat and make a cheesy roux. Add that to the tofu scramble to make it soft and delicious. More Tofu Scramble Recipes you’ll love! I hope you’ll enjoy this basic tofu scramble as much as I do! You can always experiment with adding different herbs, spices, and add-ins! Let me know if you give this recipe a try! I’d love to hear how it turns out for you. If you don’t want to miss out on new recipes, subscribe to my weekly newsletter and follow me on Instagram and Facebook! 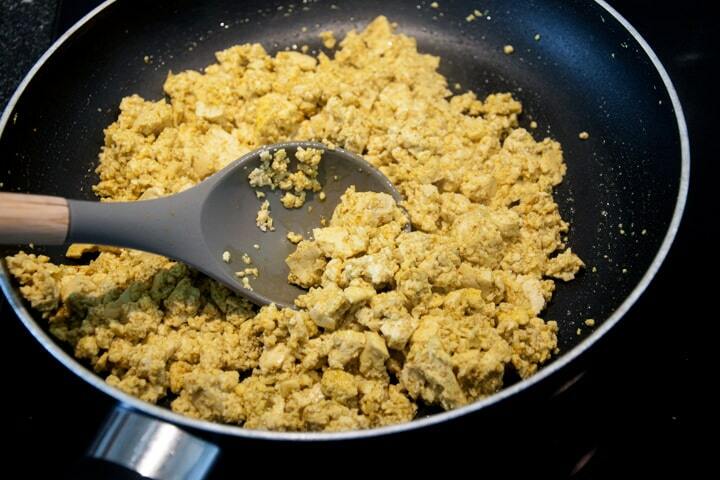 Tofu Scramble is THE perfect vegan alternative for scrambled eggs. A special ingredient will make it taste and smell super eggy! Heat the canola oil in large pan and scramble the tofu with your hands or use a fork to do so before adding it to the pan. Add the curry powder, turmeric powder, and kala namak. Mix well, so the tofu gets an even yellow color. Keep it on high heat while stirring for about 5-10 minutes (I like to cook it until there are slightly crispy bits, cook it shorter for a softer tofu scramble). You can add more kala namak or spices to taste. Enjoy! Can you reheat Tofu Scramble? Absolutely! Just put it back in the pan and heat until warm. If you want to add moisture, you can add a splash of non-dairy (and unsweetened!) milk. What to do with leftover Tofu Scramble? You can reheat tofu scramble OR you can use it in a vegan "egg" and veggie stir-fry (fried rice), on breakfast pizza and it's amazing as a wrap filling! I don't have Kala Namak. Do I really need it? I'm a HUGE fan of Kala Namak. 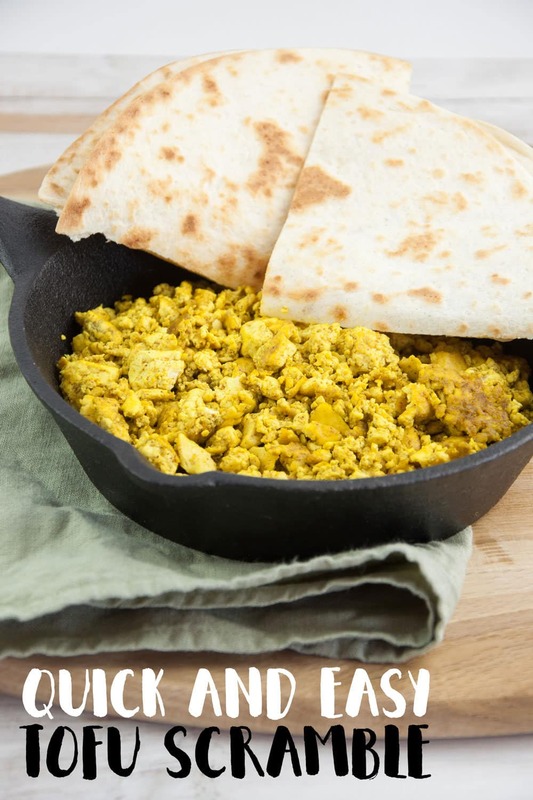 You can totally make Tofu Scramble without Kala Namak, but it really doesn't taste the same! You will be missing out on the typical eggy taste and smell. 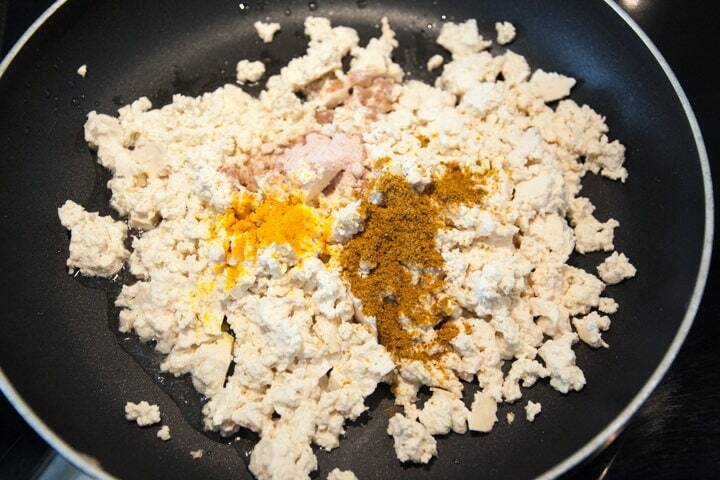 Kala Namak is not only amazing for tofu scramble, but also for vegan omelets made with chickpea flour. In my opinion, it's worth buying it! I want to make soft scrambled 'eggs'. Any advice? I prefer having crispy bits in the Tofu Scramble, but my friend is a sucker for soft 'tofu scramble'. You can achieve this by adding unsweetened plant-based milk or cream such as oat cream while cooking it. Or you can whisk together oil, flour, and nutritional yeast over low heat and make a cheesy roux. Add that to the tofu scramble to make it soft and delicious. This post first has been published in August 2015. Updated in February 2019. Previous Post: « 15 Seitan Recipes – The perfect meat substitute! I always did love a good tofu scramble when I could still do soy! Tofu Scramble was actually one of the first veganized dishes I made and I still love it till today. It’s such a neat alternative to scrambled eggs. Hi Thomas! The nutrition facts are only estimated by a calculator. If you want to limit your sodium intake, I’d suggest cooking the tofu scramble WITHOUT the salt and only adding the black salt AFTER cooking. Sprinkle it over the tofu scramble on the plate. That way you’ll be using much less salt! Thanks, Natalie. mhhhh…hemp tofu sounds really good! Now I want to try that too :D but I think it’s much harder to get hemp tofu here. I love that you used kala namak — what a great idea for that “eggier” taste. Looks delish! I have never tried tofu scramble before! It looks amazing! I’m not a tofu fan really, but I would still choose this over eggs ANY DAY!! Oh wow! I didn’t know :D Oh how I hated cracking eggs…ugh.. I love scrambled tofu! I think it’s so much better than scrambled egg! :-) I actually just took pictures of my tofu scramble a couple of days ago, so I can post the recipe next week. We do make Tofu Scramble quite regularly here too :) Kala Namak gives it that super eggy-taste and smell.. I can only recommend it. I’d never thought to use curry powder in a scramble before, I’ll be trying this the next time I make it! Do you have to press the tofu first? I always get that tofu taste coming through. Thanks, these look delicious! I never press my tofu. The tofu I use is pretty firm to begin with. But of course, you can press the tofu if you think it would benefit from it. 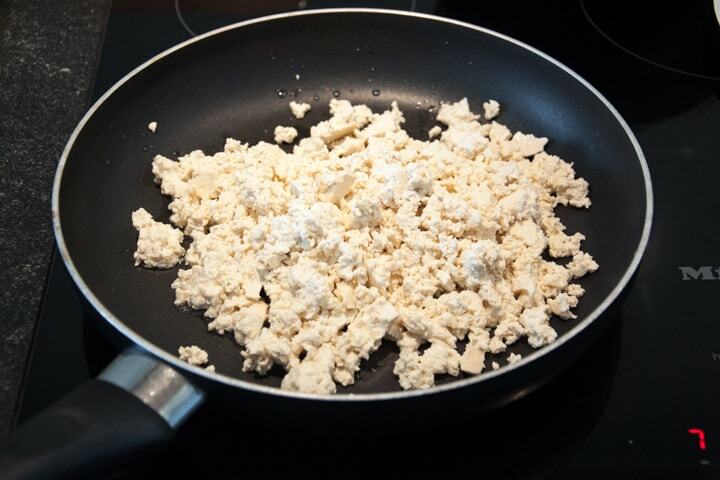 :) If your tofu is not as firm, it will be more like a ‘soft scrambled tofu’. But that’s delicious too!